Armando was born (1943), raised and educated in Mexico City. After three years of Economics at the University of Mexico (UNAM) and four years of Industrial Relations at the University Iberoamericana, he finished his academic career in 1967. Armando and his wife, Sharon, immigrated to the United States in November 1969 to study Bible doctrine under R. B. Thieme, Jr., pastor of Berachah Church, Houston, Texas. He continued his studies until November 1998 when he moved to Costa Rica as a missionary. Before departing he was ordained by Berachah on June 8, 1997. Thanks to the faithful, "right face . . . forward march" inculcation of Bible doctrine that I have received over many, many years in the "Valley of Berachah," I have been able to keep pace, though panting at times, with the demand for doctrine. The steady positive volition and enthusiasm for the Word inevitably has spilled over to friends and family in the "free world" resulting in Bible classes in two homes and a park, as well as the exponential growth in the distribution of publications and cassettes. "Prof, I only have 22 of my 39 irrevocable absolutes. I need the other 17." It took me a minute to realize that he wasn"t questioning Divine provision, but noting a deficiency in his study notes. Cassette series, currently in progress or completed, include "Después de la Salvación Qué?" (After Salvation, What? ), "El Evangelio de Juan" (The Gospel of John) "Romanos" (Romans), "El Plan y Essencia de Dios" (The Plan and Essence of God), "La Barrera" (The Barrier), "El Plan Protocolo de Dios" (The Protocol Plan of God), "Oración" (Prayer) and several Christmas specials. In addition, both prison and "free world" students who express the desire to prepare to communicate the Gospel and Bible doctrine receive and study Spanish editions of Greek and Hebrew language texts and the Systematic Theology of Lewis Sperry Chafer. So goes the advance—town-by-town, park-by-park, doing what I love best, fulfilling the role of a herald of the King, teaching His infallible Word. There are many Central Americans who these days have something they did not have before, salvation and Bible doctrine with which to grow—all of which was planned and provided for by God"s grace in eternity past. Members of the Royal Family of God in the client nation, advancing believers in Central America, and Armando have had the opportunity and privilege of being conduits of that grace provision whether through teaching, prayer, giving, translating, or one of the many other invisible support functions. Indigenous multiplication by Grace? Undoubtedly! 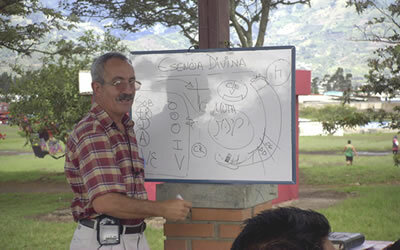 Armando's objective is to transfer, in Spanish, the immeasurable heritage of accurate Bible teaching which he received, to those who are positive to the Word of God in Central America, particularly to those having the spiritual gift(s) of communication who are yet again charged with passing that same heritage with precision.